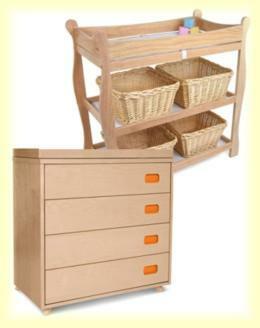 Changing tables are, arguably, one of the most important items of furniture in your baby nursery. Changing your baby's sweet bottom will soon become a big part of your day. Add to this, changing clothes, cutting nails, brushing hair, wiping sticky eyes and checking up baby's nose, not to mention tickling, kissing and nibbling that bare tummy and toes, and you may as well camp out at the baby changing table for the first few months. Of course, you will still need to feed baby, and, if you are lucky, you may get an hour or two of sleep. Seriously though, your baby's changing table will be very, very well used over the next 18 months or so. So how do you know which type will be best for you? With the large range of styles and brands currently available, making a decision on the best changing table for your baby can leave you feeling somewhat overwhelmed and confused. I hope to alleviate that feeling with the information on this page. Each is available in various styles and finishes, with its own set of advantages and disadvantages. Different brands bring their own individual look to each of these styles. Which one you prefer, will depend on your personal taste. Higher prices are usually due to the quality of materials used and the extent to which the baby changing table has been handmade. These come in various styles and finishes. Some are completely open, others have open space with a few drawers or cupboards. Baby goods are stored either directly on the shelves or in baskets slotted into the space. There are also corner models available that save floor space but unfortunately do not provide optimal storage. 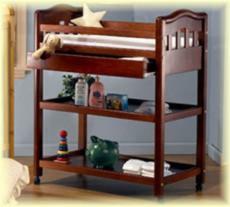 The big advantage of the open changing table is its appearance. You can color co-ordinate your baskets to go with the rest of the baby nursery and make it look really pretty. The disadvantages are, that in reality it provides less storage space than a dresser, is less sturdy, and crawling babies have a predictable habit of pulling baskets onto the floor and tipping everything out. It really is just too much temptation. Also, if your have cats, you know they just love baskets! These tables come in many different styles, but there are basically three types. 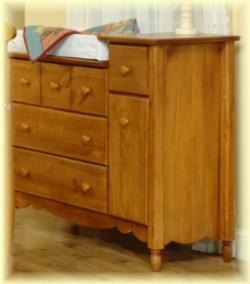 Dresser with fixed changing table. Dresser with optional changing facilities. One of the following would be attached to the dresser, to be removed later when you no longer need it: a changing tray, a contoured changing pad or a hutch (shelves). Dresser with a flip top. The jury's out on the issue of safety with these models. Some say that the extra weight of the top flipping forward makes the table unstable. Others say that this is one of the safest tables because it affords your baby the largest changing area, thereby reducing the likelihood of a fall. If you decide to go for one of these, I would suggest that you check for the alleged instability. Even if you are satisfied that flipping the table out will not result in instability, make sure that you strap the changer to the wall to prevent the possibility of tipping. The advantages of a dresser changing table are that it is sturdier than the open front, it has more storage space, baby goodies are tucked out of sight, and in the case of the dresser with optional changing facilities, it can be converted to a dresser when you no longer need a changing table. This is probably the best space saving option. 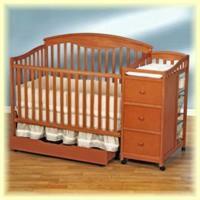 Because the changing table is attached to the end of the crib, it takes up less space than a separate furniture item. Unlike some of the options below, you still have storage space. 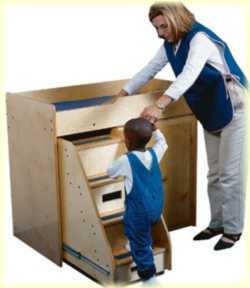 With some models, the changing table is detachable and mobile, and can convert to a nightstand. An added bonus: the price of the combo is less than the price of a similar crib and changing table bought as separate items. This is a great option for using up the left over space in those awkward corners. 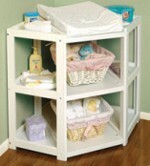 Folding baby changing tables can be stored under or behind the crib when not in use. 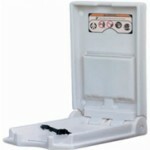 Check for stability though, and keep your changing supplies nearby. This humble option is not the most attractive, but it is a fantastic space-saver. You could always hang a wall hanging over it when it's not in use. Be sure to have a flat surface or shelf nearby for your basket of changing goodies. With this option baby can be changed on the floor, a bed or any flat surface. Store your changing goodies in a basket near the mat so that you can move them around with it. The changer 'n bath combo. The changer with slide out steps. The hand painted changing table. And that's about it for baby changing table types and styles! Click here for more information on baby changing tables, including features to look for, safety, money-saving ideas and accessories.